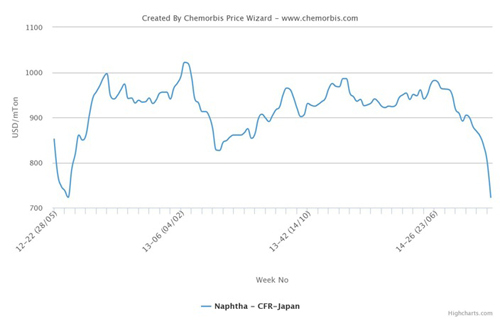 In Asia, upstream PET production costs gained ground during this past week while crude oil and naphtha prices also showed an upward trend, according to ChemOrbis. At the moment, PET markets appear to have responded to these developments, although slowly. The high season is just around the corner and the direction of the PET market could head north in line with the recovery in buying interest. In upstream news, Asian spot MEG prices gained $25/ton during this past week while PX moved up by $15/ton. However, PTA costs softened by $20/ton during the same period. Meanwhile, in the contract market, Asian April PX contacts were announced with $20-50/ton hikes from March levels. Following Saudi Arabia’s air attack on Yemen, crude oil prices moved up above the $50/bbl threshold. 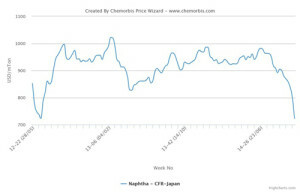 Asian naphtha prices, which retreated for the large part of March started to recover again, after March 18, and they gained around $65/ton increases during this past week. In Southeast Asia, buying interest was also disappointing, according to players’ reports, but the general market expectancies remained on the bullish side when considering the firmer upstream costs as well as the approaching high season. A trader offering on behalf of a Thai producer reported seeing improved demand in Vietnam due to the approaching high season for PET applications.